Easy Insurance Scripts has helped more than 2,500 independent insurance agencies across the U.S. and Canada become more profitable. With a unique system that provides online scripts to guide agents through insurance solutions for policies and procedures, marketing, human resources, errors & omissions, and customer service, it’s the only company of its kind offering powerful, tangible resources. Focusing exclusively on independent insurance agencies in the US and Canada, Easy Insurance Scripts saw many agencies confronting procedural issues with staff and customer service. Founder and CEO, Ted Baker, said: “there is often very little training and consistency offered for new staff and incoming insurance agents, so we wanted to create scripts to help guide agents through every interaction and policy question.” Easy Insurance Scripts needed a reliable way to assist independent insurance agents, but realized it wasn’t sustainable or feasible to create this solution from scratch. Easy Insurance Scripts is partnering with Zingtree to combine 40 years of insurance experience with the dynamic technology of interactive decision trees. With a comprehensive platform for creating consistent training and call scripts, independent insurance agents are more effective, productive, and helpful. About Zingtree: Zingtree is the most user-friendly, business-ready platform for creating and implementing interactive decision trees and scripts that deliver answers faster and simplify complex processes. You can quickly create decision trees that your employees, site visitors, leads, trainees and/or customers navigate by clicking buttons to answer questions, and receive detailed analytics on how trees are being used. Zingtree makes it easy to guide anyone through complicated processes – there’s no better way to help people get answers and solve problems. Interactive decision tree scripts have allowed Easy Insurance Scripts to bring their original concept to life. 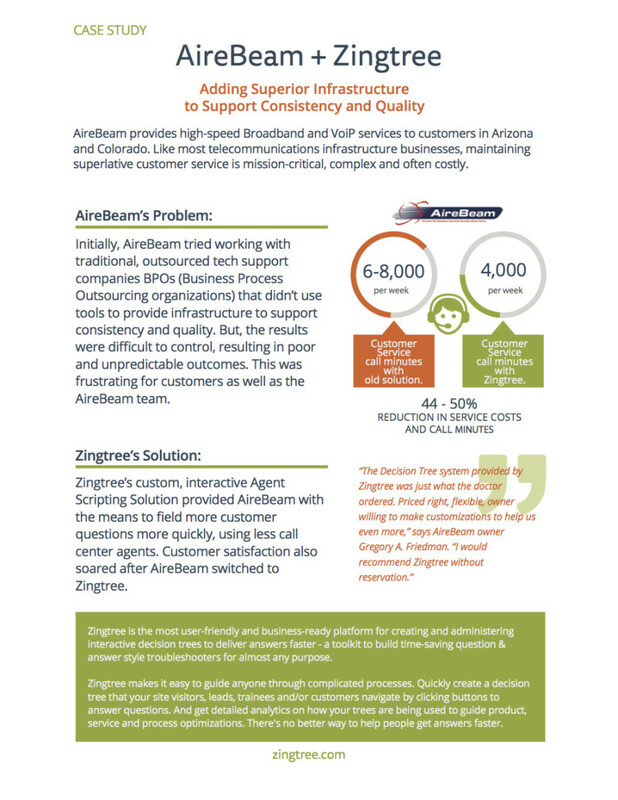 View the full Easy Insurance Scripts + Zingtree case study and download the PDF here. 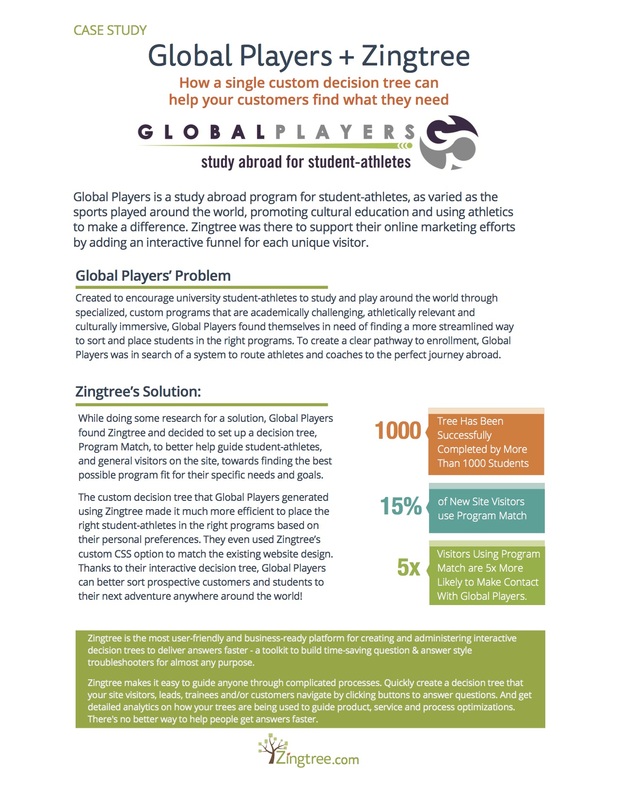 Are you an expert in a specialty like medical, sales, finance, or other areas and are interested in partnering with Zingtree like EIS above? Please contact us and we’ll talk! Want to see more? Explore the Zingtree Gallery for examples of how our decision trees and interactive solutions provide value for businesses and check out the rest of our Case Studies!